The Parlian Regions United Group (PRUG) is currently gathering signatures from local residents in opposition to the Toyo Thai Group’s proposed coal-fired power plant, to be constructed near Aunden Village, Ye Township, Mon State. On December 15th a group of Mon Buddhist Monks from the Parlian region met with State Hluttaw Chairman, Chief Minister, and the Minister of Economics and Planning, requesting them to refuse permission for the power plant. On the same day, PRUG began collecting signatures in objection to the proposed power plant. “At the moment, we have only finished gathering signatures from Aunden Village. We only collected signatures from the villagers who have national cards or ID cards,” said Ashin Nanda, Sayardaw of the Aunden Village monastery, who is also leading the signature-gathering campaign. 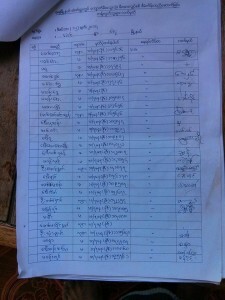 Ashin Nanda continued that there are 500 households in Aunden Village and all households, except for 15, provided their signatures in opposition to the project. Along with their signatures, photos were taken as evidence proving that they provide signatures in accordance with their true wishes and desires. PRUG held a meeting this past Friday, December 19th, in which the group announced that it had already collected more than 1,000 signatures. The group stated that it would continue to collect signatures from other villages in the region, including Nee-nuu, Thar Ka-ran, Nee-karot, and Palaing-thee. “We definitely do not want this project. We do not want to see our area [destroyed], so I provide [sic] my signature,” said U Min Kyi Shein, who provided a signature for the campaign. After gathering signatures, PRUG will submit them to the Union and State government, as well as other relevant departments. The Ye Social Society (YSS) group has been gathering signatures from local residents in opposition to the coal-fired power plant since late August; currently having gathered 5,000 signatures from the Aunden area. On December 14th, YSS led more than 400 local residents in a protest against the proposed power plant, marching in downtown Ye. PRUG was founded in late 2013, with the objective to working in cooperation to find solutions for any problems that arise in the region; the group holds monthly meetings.